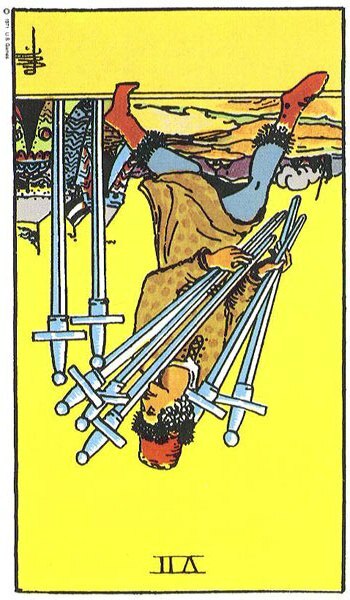 Troubling cards today: is someone rushing in impulsively (Knight of Wands reversed) to steal another person’s ideas or approach (Seven of Swords reversed)? If these cards were upright I would think that this person just might get away with it (what a jones!) but, reversed, I feel that this won’t be the case — this particular thief is rushing into something so hastily that he (or she) does not realize that these actions have consequences. What is happening here will lead to nothing but trouble: trouble for the person committing these deceptive acts, and disappointed astonishment/disillusionment from the person against whom this deceit is directed. I really don’t like these cards. If you are drawn to another person’s idea, make sure that you give that person credit before drawing on those ideas in your own work. That’s common sense, right? But sometimes the Knight of Wands isn’t prone to common sense. 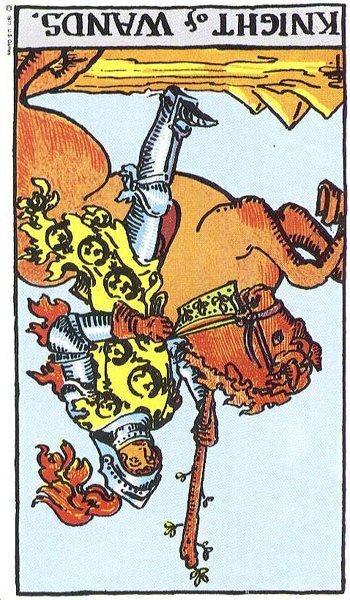 Also, knights, in some ways, are cards about experiences that test us. Consider that someone may be testing you today. Act appropriately. Likewise, you may be tested, or have your patience tested, at the very least, by today’s events. Stand up straight and tall, keep your chin up, and put on your best behavior, please. Take the dishonor implicit in these cards and turn it into honorable conduct. You’re welcome, and I’m glad you liked the post! 🙂 I’m impressed that you just finished NaNoWriMo…I have been wanting to do that for quite some time but have never pushed myself enough to get there. DO IT!! you will NOT regret it. you might not eat well for the timeframe, and you might exist on coffee and little sleep, but you will be so glad you did. if i can do it: you can. Normally I don’t read post on blogs, however I would like to say that this write-up very pressured me to check out and do it! Your writing style has been surprised me. Thanks, very great article.